One of Gordon’s defining features is its close proximity to Boston—the global hub of higher education, innovation and opportunity. With just a quick drive or a short train ride, students can be in the center of this historic city, and partake in everything from enjoying a free ride on a sailboat in Boston Harbor during a sailing club’s Open House days to viewing one of the largest collections of Claude Monet’s paintings outside of France. Playing the role of classic Boston fan. Historic Fenway Park is famous and so are its baseball fans inside. This past year, both the Red Sox and the New England Patriots won championships and celebrated with victory parades throughout the streets of Boston. 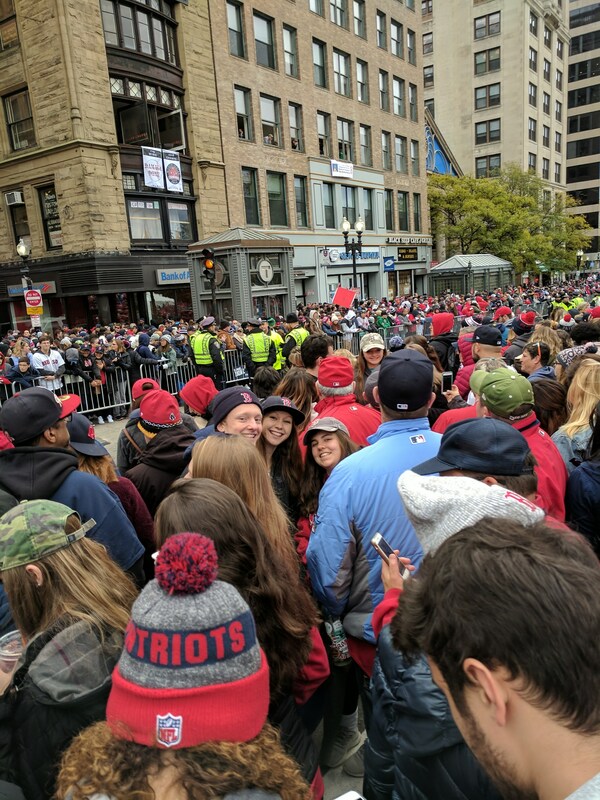 Porter Sprigg ’19, Abby Provencher ’19 and Emma Cox ’19, along with dozens of other Gordon students, joined the throngs crowding the city streets, hoping to catch a glimpse of Mookie Betts and Tom Brady. Enjoying concerts by Pentatonix and the Boston Symphony Orchestra. The Music Department travels to Tanglewood Hall to see the Boston Symphony Orchestra perform. Musicians of all kinds, from pop singers to small indie bands, stop by Boston on their tours; Amber McCarty ‘19 and Jesse Cook ’19 attended a Pentatonix concert this past fall. Seeing Hamilton and the Harvard Observatory. 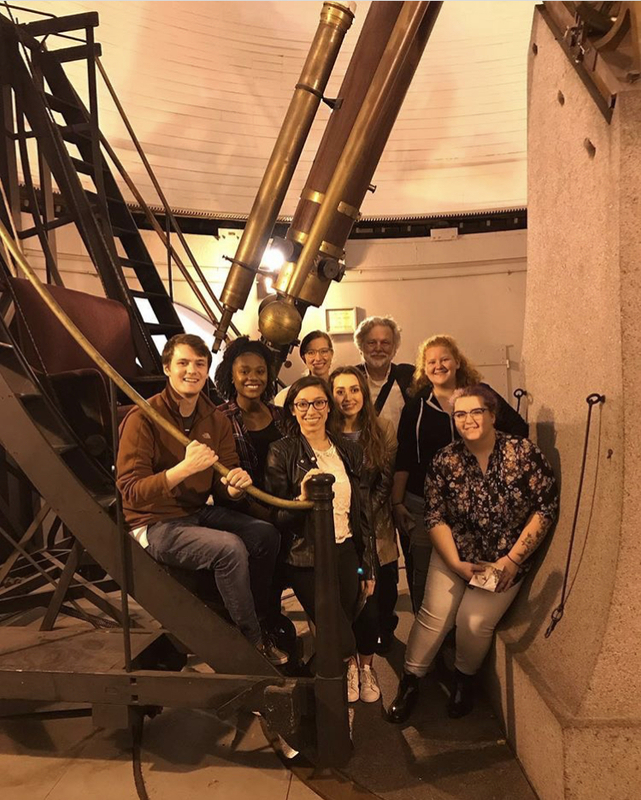 As part of their preparation for their performance of “Silent Sky,” the cast of the Theatre Department’s fall show took a field trip to the Harvard Observatory, where the show is set. Traveling Broadway theater companies visit Boston often; several Gordon students and alumni, such as Merisa Kuovo ’18, saw the smash hit musical Hamilton performed at the Boston Opera House this past fall. Discovering ancient Egyptian sarcophagi. Students in Historical Perspectives, a core class at Gordon covering a vast range of historical periods, often visit the Museum of Fine Arts, as all Gordon students have free access to the museum. Jessica Vandervort ’20, the teaching assistant for Dr. David Goss (history), loves organizing tours through the museum’s different displays and creating scavenger hunts to help students learn about the artifacts, especially her favorite, the Greek Hoplon Shield. Swing dancing with the MIT Ballroom Dance Club. Recently, Gordon’s Swing Dance Club, led by Sydney Cooney ’19 and Alyssa Penner ’21, attended a 20s-themed social hosted by the MIT Ballroom Dance Club to meet other students passionate about dancing. As one of the best competitive ballroom teams in the nation, MIT’s club members were able to teach the Gordon students plenty of new moves. Serving with the Boston Project.Gordon’s Office of Service-Learning and the Clarendon Scholars volunteered at the Boston Project, a Christian nonprofit dedicated to creating interracial reconciliation and inclusive community. Julianne McKay ’19 and other students helped with a weekend leadership workshop with high school students to educate them about mental health. Interning with nonpartisan organizations and refugee ministries. Many students secure internships in Boston, which can lead to full-time jobs after graduation. Jonathan Markgraaff ’20 currently interns with Massachusetts Fiscal Alliance, a small non-partisan organization that seeks to create transparency in Boston’s capitol; there, Jonathan researches the current legislations. Morgan Sprinkle ’19 interns with the Greater Boston Refugee ministry, an organization that works to reform refugee ministries. Spending Sunday mornings at Park Street Church. With the help of Gordon’s Chapel Office, Boston-area churches coordinate rides for students to and from the city. This year, we have a number of students who attend Park Street Church, African-American Jubilee Christian Church and Boston Chinese Evangelical Church, among others. To make it easier for Gordon students to attend churches in Boston, Javare Peart ’20 drives students to North Station every Sunday in a Gordon van, so that they can take the subway to church. Taking advantage of Gordon’s proximity to Boston—in work and in play—is one way students can tap into the liberal arts value of transforming students into well-rounded individuals. You could say that Boston is our playground, our laboratory, and our greater neighborhood. By engaging with this global city, Gordon students are well poised to bring their knowledge, skills and experiences to Boston and beyond.